Bitty Software is a relatively new endeavour which concentrates on smartphone apps for use with the BBC micro:bit and offers free coding tutorials where you can learn to write the micro:bit code which is needed to make a micro:bit work with one of the Bitty Software apps. Tutorials are available for both C/C++ developers and those who prefer a visual programming language. In the latter case, Microsoft's excellent PXT is used. The ethos behind Bitty Software is that in this emerging age of IoT, learning to code is just one dimension of the technology journey which youngsters need to take; learning about connectivity and communications is essential too. Hence the focus on systems which involve one or more micro:bits, a smartphone or tablet and in the middle, enabling the whole thing to work, Bluetooth. Despite being such a relatively new concern, the Bitty Software web site www.bittysoftware.com is rapidly accruing a really useful collection of micro:bit programming resources, including some great videos. Take a look.... the bitty data logger application demo and the micro:bit Eddystone beacon demos are particular favourites. Bitty Software already have 4 applications for micro:bit, all of which are available for both iOS and Android. There are more in the pipeline. Watch this space! I thought it would be interesting to see how well the new Bitty Software application Bitty Data Logger would handle capturing accelerometer data from a micro:bit attached to a moving vehicle. So.... that's what I set out to discover. There were some practical issues associated with planning this project. One person would need to drive and another hold the smartphone and operate the app whilst standing at the side of the road. I'd need a suitable stretch of road where I could drive fairly fast without breaking the law or having a horrible accident. And of course "smartphone operator" and driver would need to be able to communicate so that the driver would know when the app was connected to the micro:bit and data capture activated in the the bitty data logger app. My long suffering wife got the job of smartphone operator, with me behind the wheel of my car. We'd devised a system of hand signals she could use to indicate she was ready and I could start driving (none of which were rude!) and I dropped her at a suitable point on a local A road, drove to the end of the road and came back around the roundabout ready to drive past her. 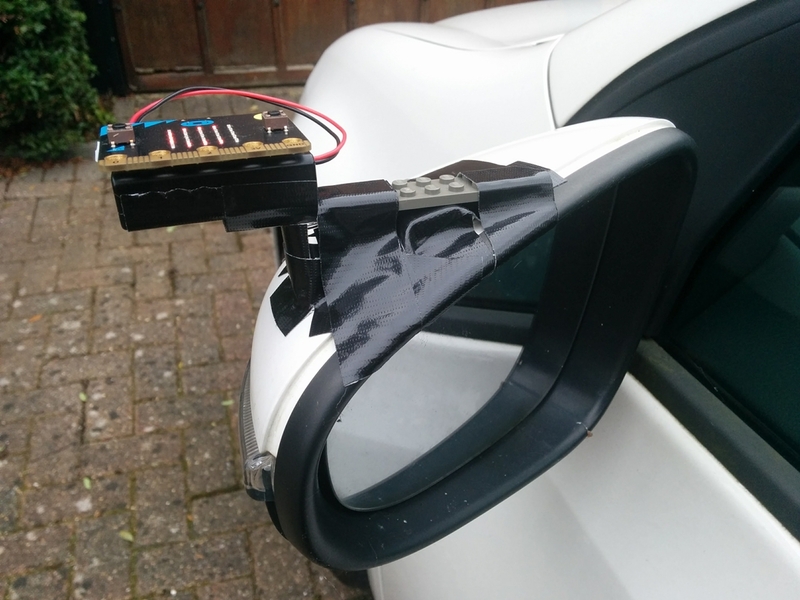 I awaited her signal as she scanned for and connected to the micro:bit mounted on my car's wing mirror and activated data logging. 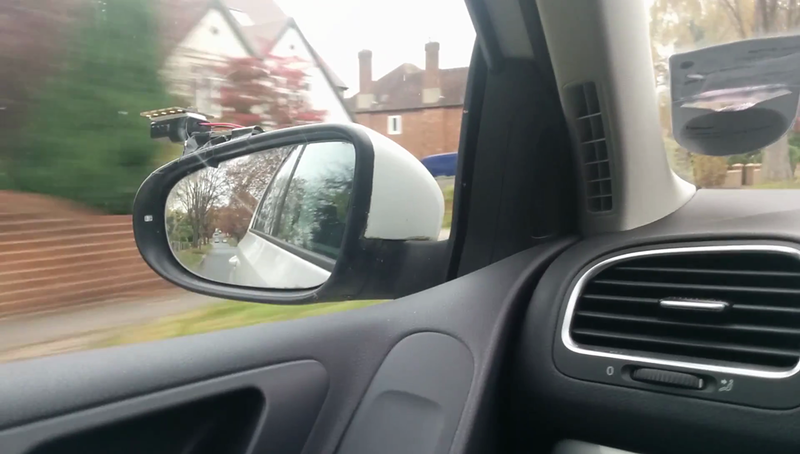 When the signal came, I immediately put my foot down and accelerated up the road in her direction. For about 2 seconds. I immediately got stuck behind another car. Yes, there was a lot of traffic about, and I did wonder what effect all those large metallic objects might have on Bluetooth radio communications. I pulled out past the slower vehicle and put my foot down again. About 2 seconds later I was at 60mph and held that speed until the next set of traffic lights forced me to decelerate. Don't worry - this was taken by my passenger before we started data logging! Had the experiment worked? Had we captured any data? Happily the answer was a big yes! The plan had been for my wife to start capturing data when I was at the roundabout about 50 metres away and driving towards her and then deactivate when I was an estimated 100 metres past her. It looks like everything worked a treat. Here's the resultant data in chart form with a manually drawn trend line which shows broadly how things panned out. Note that this data is completely raw. The micro:bit accelerometer generates data that is somewhat "rough" and it's best used by applying a low pass filter to it to smooth out its roughness. Maybe a later release of Bitty Data Logger will give you the option to have it do this for you. My guess is, the sudden deceleration and then acceleration shown near the start of the chart correspond to me having to pull out and overtake the car that was blocking my way. After that, the general trend shows constant x axis acceleration, averaging around 0. The Z axis just shows vibration and general bumpiness I think! I think I can declare today's little experiment a success!